The historic wholesale market has moved to new swanky (but sadly, institutional looking diggs) but there is still so much to see and do at the old outer market and surrounding neighborhood. You really need to keep this on your must-see list. We are sure the new Toyosu fish market is interesting, you may even want to head over there for the famous tuna auction. BUT then you simply must come back to the old market area which has so much more personality and atmosphere. 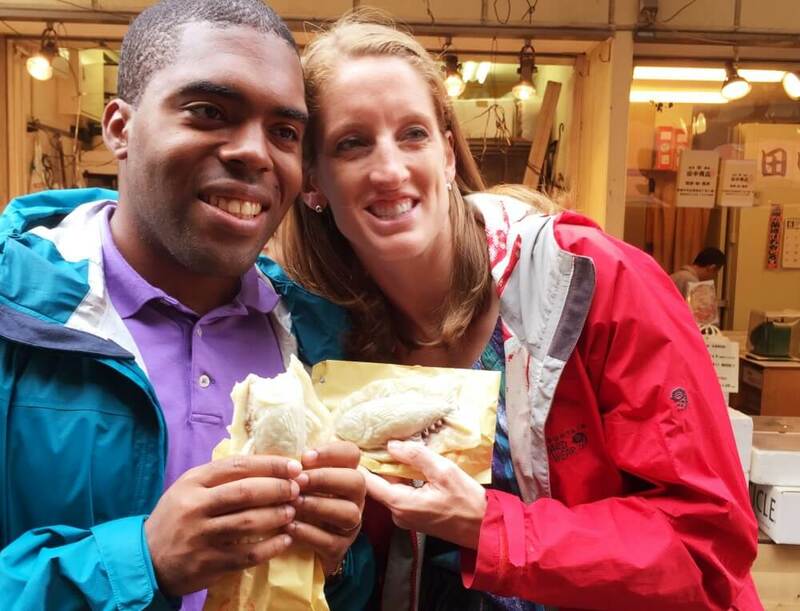 There are hundreds of reasons to explore this delicious traditional market. But here is our top 15! 1. The outer market area is older than you might think. It actually pre-dated the famous wholesale fish market. This neighborhood has been growing since the samurai times, for more than 300 years. Many of the businesses date back 100 years or more! 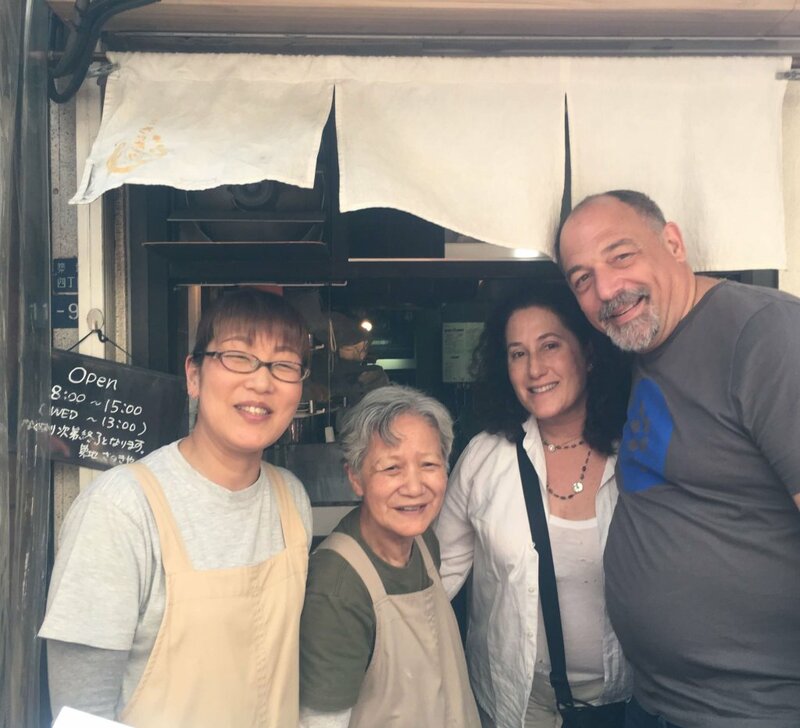 So if you really want to get a flavor of Tokyo’s traditional cuisine and character, the old market is the place to be. 2. Too many shops to count! Though the fish market hosted over 700 wholesale seafood vendors, the local outdoor market has just as many if not more delicious places to shop. There is also a ton of variety; you can try everything from sushi, of course, to beef rice bowls, dried fruits and nuts, and any other kind of seafood you can imagine. You can even find one of the cities most delicious fresh baked croissants. 3. Not all of the fish vendors moved to Toyosu! Many visitors don’t know or haven’t read that over 65 of the inner market seefood vendors elected to stay in this special neighborhood. They are housed now in a specialty market space that was designed to bridge the gap when the inner market made their big move. These vendors still sell wholesale and the pricing is fantastic, but they are also quite friendly to visitors and understand the benefit of tourism. 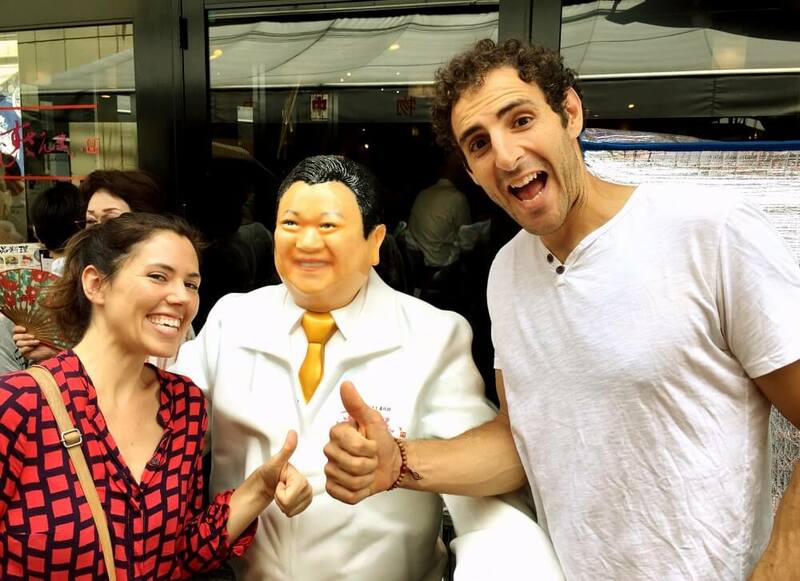 These folks are proud of that the tsukiji brand that has grown to be world famous over the last 100 years! 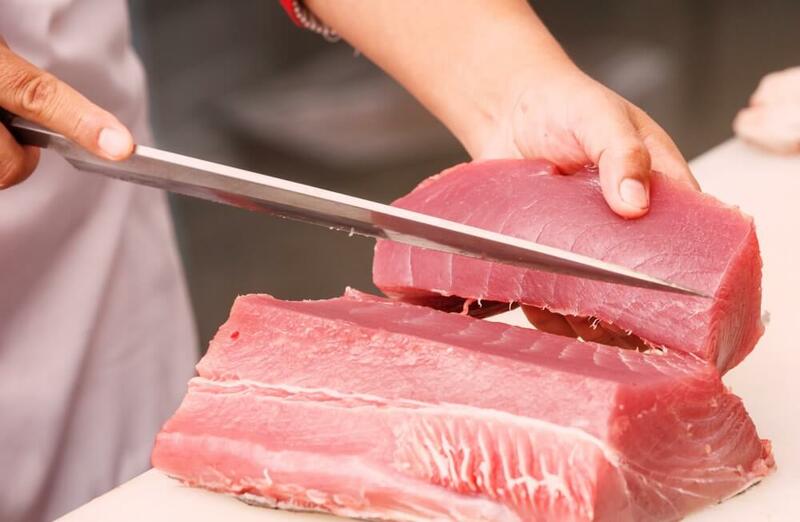 You can try so much delicious seafood from the 65 specialists including the most delectable fatty tuna, seasonal specialties, jumbo rice crackers, fresh fruits and vegetables, and an unbelievable variety of ingredients to use in your home kitchen as well. 4. You really need to buy an amazing fish knife! The outer market hosts four fantastic knife makers, who specialize in Japanese steel with traditional and modern handled knives. Most sushi chefs in Tokyo have bought at least one knife from one of these experts. In fact my favorite knife shop in this neighborhood is over 150 years old and their family started out as samurai sword makers more than 600 years ago. You will not find better knives anywhere in the world. 5. 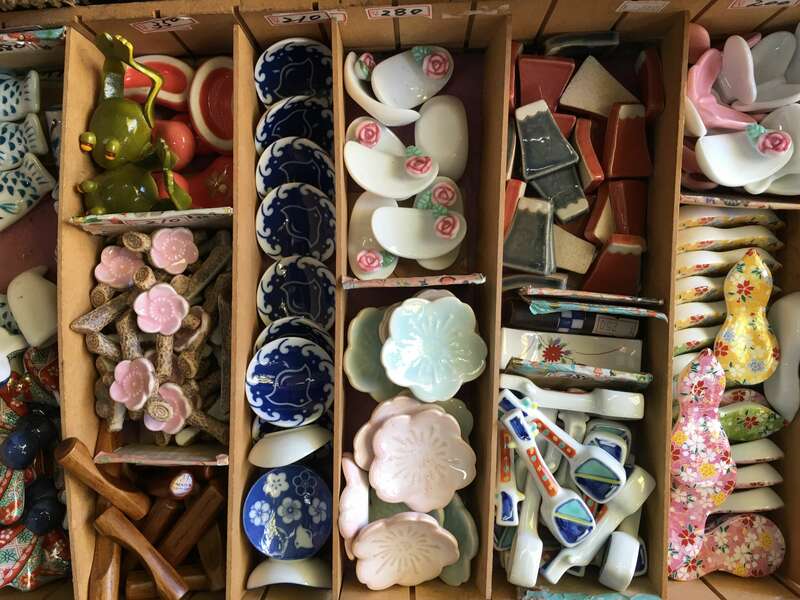 Beyond food items you can find creative useful and truly beautiful souvenirs for food fanatics at the market in Tsukiji. There are shops here that sell traditional kitchen items (mostly handmade.) You could also purchase beautiful pottery for every day and special occasion use. Some of my favorite souvenirs from the market include traditional sushi aprons, sake service sets, chopstick rests and even a cute thermal lunch bag to carry your bento lunch box to home or to work. 6. Marvelous matcha (green tea) is readily available in several different forms at the outer market. You can try some of the best soft serve matcha ice cream, buy green tea of all varieties to take home with you, and even find green tea flavored snacks, crackers and candies! 7. People watching! The market area is home to locals and visitors a like. If you want to see a cross-section of Tokyo food communities this is the place to go. You can rub elbows with famous chefs and regular local people bringing home the best seasonal ingredients to make dinner that night. 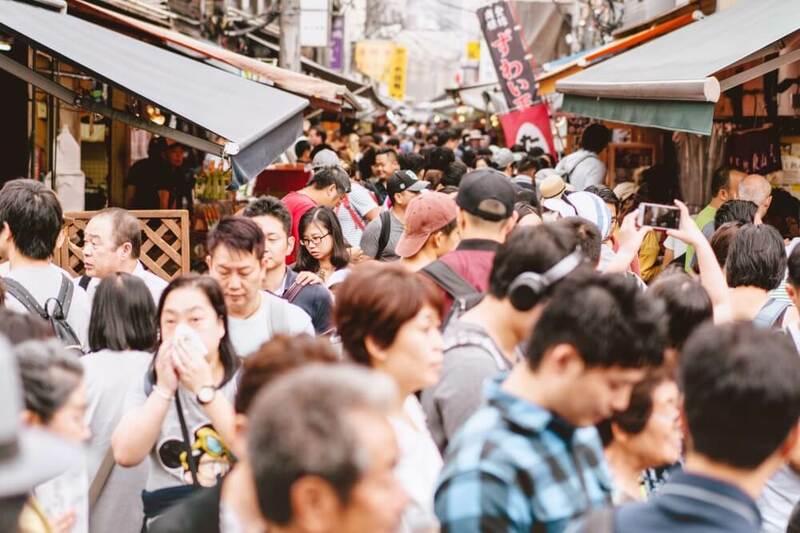 In fact, many world-class chefs from Europe and the United States find this market to be a must see spot every time they visit Tokyo. 8. Find out more about different regions and what they’re famous for. One of the port authority market buildings at the entrance to the area is made up of separate stalls from many regions across Japan. If you want to get an idea of the specialties from Hokkaido to Okinawa, browsing through this market building is an exciting way to spend a morning. There is a lot of regional pride across Japan and a lot of focus on each area and each climate producing the best possible ingredients. And in Tokyo we are lucky, because at the market we can try them all! 9. Try a truly unique, one-of-a-kind dessert! You may have seen, in your travels across Japan, a traditional dessert called taiyaki. 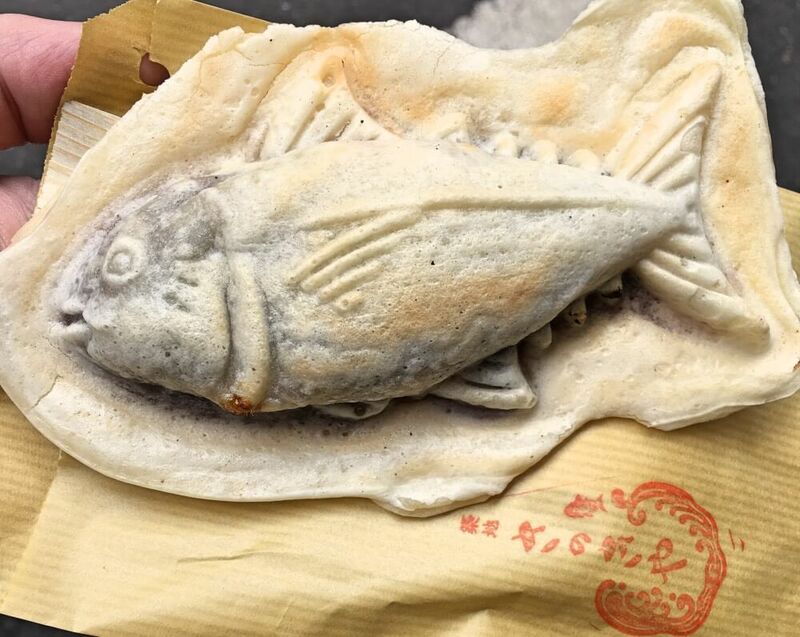 This is a fish-shaped redbean filled treat made from sweet dough expertly grilled. Normally this desert takes the shape of a sea bream, considered a lucky fish in Japan. At the market everyone knows that tuna is king, so this is one of the only places across the country where you will get this desert in the shape of a tuna! This shop is amazing and adorable but not as cute as the owner. She and her daughter run this shop and they are so friendly and charming that I’m not sure if people come back for the delicious dessert or the lovely service, it’s probably a combination of both. One must-try here is chutoro, which is the hot, redbean filled dessert with a special twist — it also includes heated apricot which adds a nice sweet and sour taste. 10. Oysters as street food! There are at least two stalls in the market where you can try the freshest, huge oysters from Hokkaido and other areas of Japan right at the shop. They even provide Tabasco and other condiments so that you can customize your oyster and eat it on the spot! 11. Of course, go for the sushi! The outer market hosts dozens of delicious sushi restaurants from small mom and pop establishments to famous Tokyo chains, you can try sushi of all sorts. 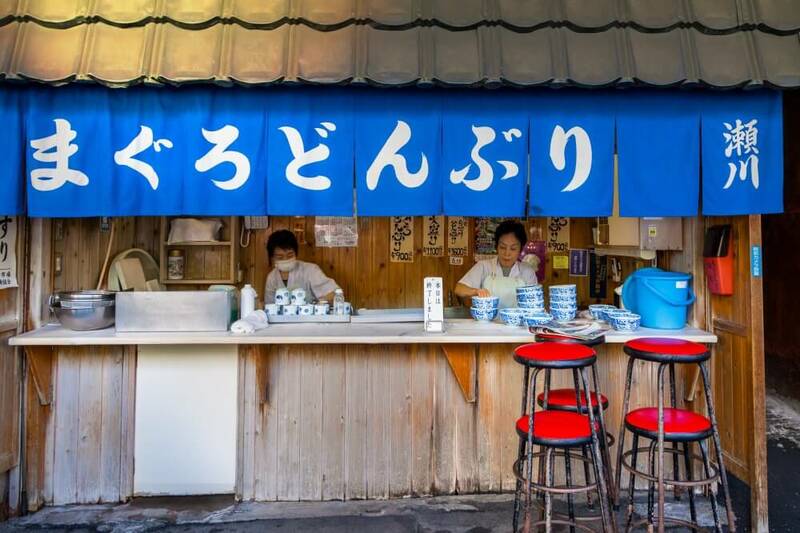 One of Tokyo‘s most famous sushi chains, Sushi Zanmai, calls Tsukiji market it’s home. The owner of this chain has gotten fish-market-fame by being the highest bidder many years for the famed New Year’s fish auction, spending sometimes as much as 5 or 6 million yen for the first tuna of the year! 12. Perfect pickles please the palate. Japan has a strong culture of pickling vegetables to use as side dishes with almost every meal. Almost any vegetable and Japan can and will be pickled and the variety of textures and flavors is really mind blowing. Some of my favorite pickle shops in Tokyo are found in this market. I recommend you browse and try. It is perfectly acceptable to take a package of sealed pickles home in your luggage so don’t worry this can also make a great souvenir. I recommend also stopping by some of the pickled plum shops. This delicious item called umeboshi in Japanese comes in a variety of different styles. You can try the pickled plums with honey or with spice or just on their own. They are quite sour and sometimes are an acquired taste, but you only live once! 13. Try the best soft serve ice cream! It may surprise you about some of the best flavors and largest variety of soft serve ice cream stores are in the outer market. You can try seasonal fruit flavors and of course the green tea softserve I mentioned before. 14. Come here for the energy and atmosphere! There is no place in the city quite like this fish market neighborhood. Even after the move the character remains at this exciting and quite raucous place. The vendors have a long history here and their families have worked in this neighborhood for generations. They welcome outsiders but they still keep a lot of individual style. Come and soak up the unique atmosphere of this one-of-a-kind place. FINALLY Number 15. 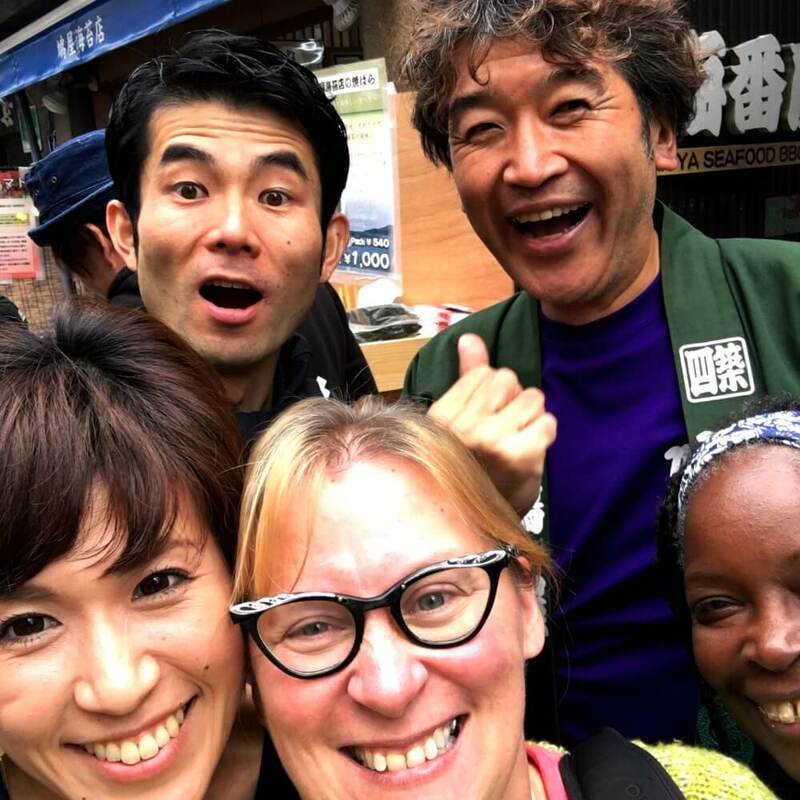 We are probably biased, but one of the best reasons to come to the classic Tsukiji Market area is to take our breakfast food tour! We visit all the best shops, try dozens of flavors and dishes, see the sights and then finish up at one of Tokyo’s most beautiful gardens for tea and dessert with an amazing view. The best of the market is still here in the Tokyo’s Kitchen– Tsukiji. 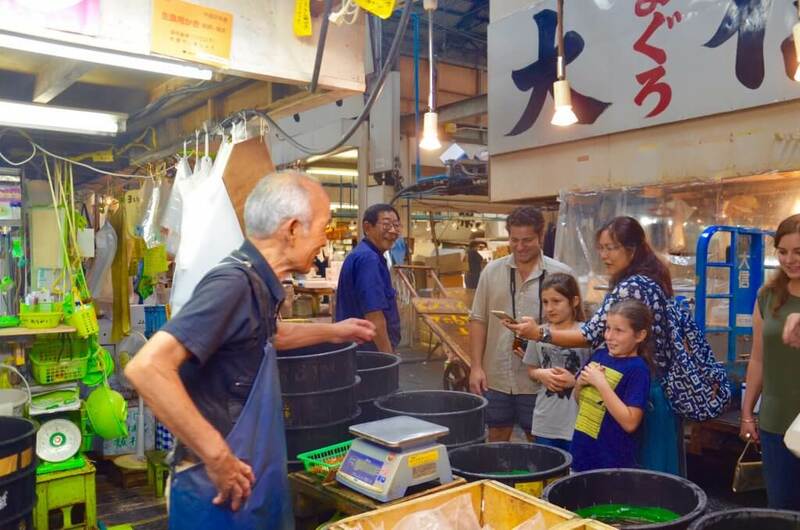 Book now and use the code “ClassicTsukiji” to save 10% on your tour! See you at the market!